Barack Obama may have pulled off a stunning victory over Vladimir Putin in the finals of last year's inaugural World Leader March Madness (orchestrated by the folks at Foreign Policy magazine), but his road to a second title will be decidedly tougher this year. Drawing French president Nicolas Sarkozy in the first round won't be easy, but Obama should sail through. Netanyahu in the Sweet 16? Please. German chancellor Andrea Merkel will be a tough Elite Eight opponent. (Her quick recovery from quintuple-beer spillage shows she's got toughness to spare.) 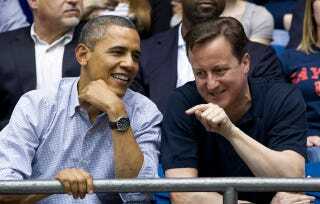 In the Final Four, Obama then may battle British prime minister David Cameron (above), with whom he shared some hoops action Tuesday night in Dayton. After all that, Obama's championship opponent will likely come down to either Putin or North Korea's Kim Jong Un, clearly the diaper dandy of this year's bunch. Assuming Un can sneak past Hugo Chavez in the opener and then (most likely) the Castro brothers, Un could end up the trendy sleeper pick in this year's tourney. It's not too late to get your own picks in. The top 10 scorers will receive free one-year subscriptions to Foreign Policy. Go now. Hurry.